Chief Minister Sarbananda Sonowal said that Assam is known for its peaceful co-existence and age-old friendship, bonhomie and universal brotherhood that exist among the people belonging to Barak, Brahmaputra, hills and plains and this unity is inherited from Swargodeo Chaolung Siu-Ka-Pha. Siu-Ka-Pha Divas which is popularly known as Asom Divas centrally organised at Jorhat by the Directorate of Cultural Affairs in association with District Administration Jorhat. He said that Siu-Ka-Pha, way back in 13th century felt the necessity of integrating so many communities to make a strong and powerful society and based on his ideals the BJP led government has envisioned Sabka Saath Sabka Vikash to lend dignity to every individual and help them to contribute to make a strong nation. He also said that Swargadeo Siu-Ka-Pha also worked to forge strong and friendly relations with other geographical entities which holds tremendous importance even today. He also said that the Act East Policy enunciated by Prime Minister Narendra Modi also follows Siu-Ka-Pha’s ideals to make friendly bilateral relations with ASEAN and BBN countries. He also said that in this context, Assam can play a great role following the teachings of Siu-Ka-Pha. Chief Minister Sonowal also said, “Strength of Assam lies in its unity. However some vested interest groups to fulfill their evil agenda are hell-bent to create divisions in our society. Government of Assam is steadfast in its objective to strengthen the age old unity that exist in the state and working relentlessly to defeat the evil design of all the divisive forces coming on the way to make a strong and vibrant Assam”. 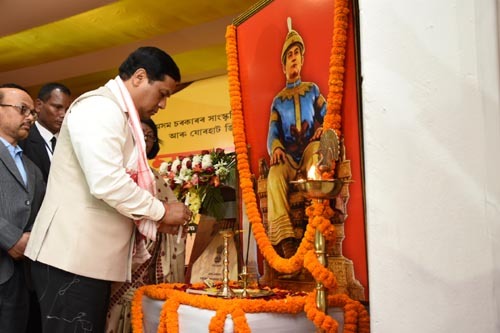 Sonowal also called upon everybody to follow the ideals of Siu-Ka-Pha to build a strong state. ‘We do not want hatred rather we want harmony’, the Chief Minister said. Assam Legislative Assembly Speaker Hitendra Nath Goswami, Minister of State for Power, PWD etc Topon Kumar Gogoi, Members of Parliament Kamakhya Prasad Tasa and Pradan Baruah, President Purbanchal Tai Sahitya Sabha Dr. Dayananda Borgohian, President All Assam Ahom Sabha Satish Chandra Gogoi, Commissioner and Secretary Cultural Affairs Preetom Saikia, Director of Cultural Affairs Barnali Sarma, Deputy Commissioner Jorhat Narayan Knowar and a host of other dignitaries were present on the occasion.